If the crowd that came out to Parkway Central Library on June 5 was any indication, migration is a Philadelphia tradition. At the beginning of the evening, librarian Adam Feldman asked us all to stand up, and then to sit if we had been born outside Philadelphia, or if a parent had been, or a grandparent. Most of us were seated by the second question, and no one was left standing after the third. To some degree, all of us were figuring out how to make Philadelphia home, and an evening of poetry, video documentary, and stories probed what it means to immigrate, to live in a place where you were not born. "Home is where you know where the light switches are," offered one poet, before sharing how for her, home is bound up in the experience of war. Another poet, a high school student who moved here from Belarus last year shared: "I am from traditions like jumping over the fire at night, I am from music like a guitar next to the flames, I am from community like walking late at night staring at stars." A Burmese man, speaking with the help of a translator, told us that in between kidney dialysis and medical appointments, gardening loosens him from his worries. A graduate student at UPenn said that she knew Philadelphia was home when she saw a line of halal food trucks, each surrounded by customers, on her commute to work. Philadelphia Poet Laureate Raquel Salas Rivera’s performance portrayed the tension between mourning for home in Puerto Rico and loving Philadelphia. Through film, an older generation of newcomers told stories of African-Americans moving to Philly in the early twentieth century. Rev. Frank Tyson and a few team members presented a video documenting the tradition of hospitality at Tindley Temple, which housed, clothed, and fed newcomers to Philadelphia under the leadership of Charles Albert Tindley. Threaded through these stories was the idea that home is something we build together, and the Free Library of Philadelphia has taken an active role in this communal home-making. Before the storytelling event, the library lobby was transformed into an art space. Visitors were invited to try their hand at silk-screen printing, making their own print of a graphic "Migration Nation" slogan. Newcomer artist Ummi Hafsah painted henna on visitor’s hands, while other artists displayed and sold textile art. Local organizations that support newcomers were represented at Making Philadelphia Home, including the Nationalities Service Center, Mural Arts Philadelphia, the Office of Immigrant Affairs, the Porch Light Program, Scribe Video, and Al-Bustan Seeds of Culture. 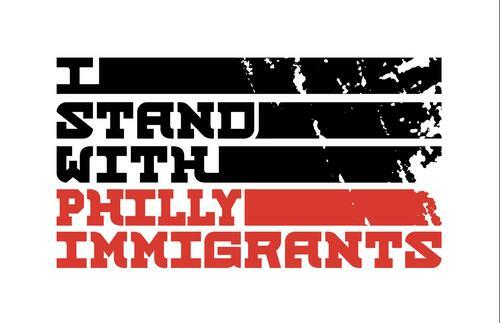 Find out more about how the Free Library of Philadelphia is celebrating Immigrant Heritage Month here. Melissa Verhey recently completed her PhD in French at Princeton University where she worked primarily on life writing and storytelling. An award-winning French teacher and writing coach, Melissa also edits and writes for the Academic Mental Health Collective.